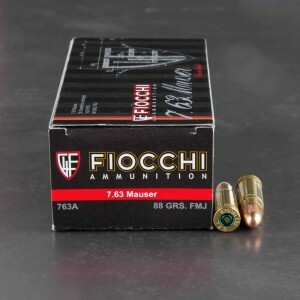 7.63 Mauser ammunition goes by a few names, 7.63 x 25mm, 7.63 Mauser, and the .30 Mauser automatic. The round is quite proficient and famous, even if you’ve never heard of it before. 7.623 Mauser ammo was the round used in the famed C96 Mauser also known as the “Broomhandle Mauser”. That’s the famed weapon Han Solo wielded in the movie Star Wars. The Mauser factory has produced some of the greatest and most influential weapons and ammunition in the world. 7.63 Mauser rounds were one of the first massively successful automatic cartridge rounds, paving the way for commercial development of automatic pistols the world over. In Europe the round was widely adopted by everyone from Australia, Finland, Austria Hungary, to Germany. The 7.63 Mauser round was not only popular is pistols, but in sub machines guns as well. The Mauser C96 was also converted into one of the first machine pistols. The cartridge found service in numerous wars all over the world, including World War 1 and the Finnish Civil War. Shoots just fine in my Broomhandle. No failures of any kind in 2 boxes. Much better than Fiocchi. Functions perfectly in my C96 Broomhandle. Great stuff. This ammo is getting hard to find.Works GREAT in my C96. Very satisfied with it. Will come back for more. Many thanks for breathing new life into my 1915 C96 Mauser! This ammunition is clean and consistant and the pistol/ammo combination groups better than some modern firearms!